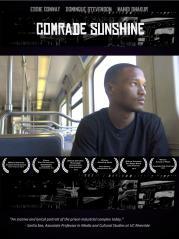 Set in Baltimore, Comrade Sunshine focuses on the friendship between Dominque Stevenson, whose Friend of a Friend program helps men in prison through peer mentoring, and Wahid Shakur, a recently released 20-year-old now working with her to help build community. As she attempts to guide him in making a smooth transition back into society, Wahid faces the new challenge of life on parole. Dominque, meanwhile, continues to raise questions about the dire impacts of incarceration. Each month, NewFilmmakers awards the Film of the Month prize to the film that sells the most downloads on NewFilmmakers Online. The NewFilmmakers Film of the Month Award shows film fans, festival programmers, and distributors that your film is PROVEN TO SELL! If your film is already online, then it is already eligible to become Film of the Month. Start promoting the online sale of your film now! If your film is not yet available for download on NewFilmmakers Online, then START NOW by GETTING YOUR DVD ONLINE! CLICK HERE to start. Get Your DVD Online for sale on NewFilmmakers Online and start promoting the online sale of your film! Sell more downloads than anyone else in one month and win the FILM OF THE MONTH AWARD. Each sale counts as one vote. A NewFilmmakers E-Card promoting your film to 20,000 Festival Programmers, Distributors, and Indie Film Fans saying that YOU SOLD MORE COPIES OF YOUR FILM THAN ANYONE ELSE ON NEWFILMMAKERS for that month. The coveted NewFilmmakers Film of the Month Award Plaque! Buy, Download, and Spread the Word! Get as many people to LINK to your Film Page as you can. The more people and web sites that can spread the word about your film by placing a permanent link to your film page, the more likely someone will VIEW your film page and PURCHASE your film. As many of your friends' Facebook Walls and Feeds. Get those you know to SPREAD the word about YOUR FILM! The film with the most sales at the end of the month is identified as the winner of the award. In the event of a tie, the film with the most revenue earned wins. In the event that after units and revenue are calculated and ranked, there is still a tie, the winner is chosen by NewFilmmakers staff. Purchases made by the film owner (the account of the user under which the film has been posted) are not counted.